Now, this is an impressive opening for the Tampa Bay Rays. Last year, the Rays pioneered the idea of an “opener” — a pitcher who would work an inning or two at the beginning of the game, facing some of the toughest hitters instead of having a traditional starter do it. Tampa Bay has still used that strategy on occasion in 2019, but that’s just part of the Rays’ strong start to the season. 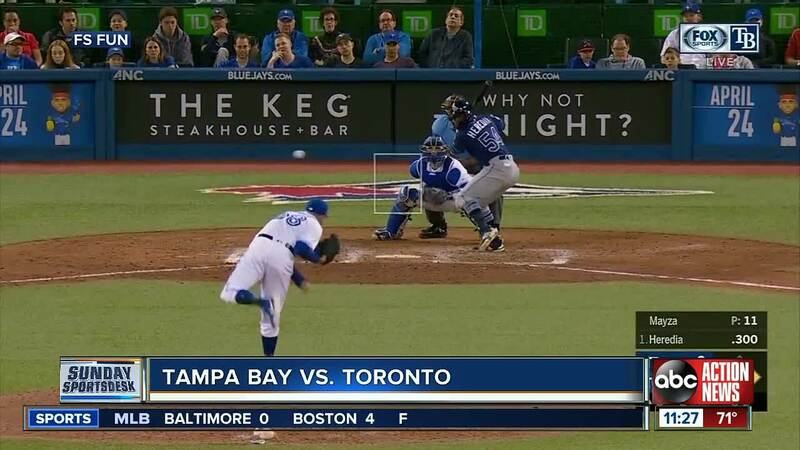 TORONTO (AP) — Now, this is an impressive opening for the Tampa Bay Rays. Last year, the Rays pioneered the idea of an “opener” — a pitcher who would work an inning or two at the beginning of the game, facing some of the toughest hitters instead of having a traditional starter do it. Tampa Bay has still used that strategy on occasion in 2019, but that’s just part of the Rays’ strong start to the season. Sunday the Rays beat the Toronto Blue Jays 8-4 thanks to a 5-run outburst in the 8th inning. Tampa Bay (12-4) has baseball’s best record and best run differential. The Rays lead the AL East by 5 ½ games, and if the gap stays that big for a few more days, a home series next weekend against defending champion Boston could start to feel a little more significant than a normal April meeting. The Rays have baseball’s best ERA at 2.44 — and the starters are even better at 1.47. Tampa Bay has used the opener a bit — Ryan Stanek has made three starts that totaled five scoreless innings — but it’s the other four starters who have really shined. The Rays are also fourth in the AL in on-base percentage and have stolen 16 bases in 17 attempts. The rest of their division hasn’t played its best yet, but Tampa Bay has earned its spot at the top so far. Tampa Bay’s first-place showing isn’t a huge shock after the Rays won 90 games last year. San Diego, on the other hand, went 66-96, but the Padres (11-6) now have the NL’s best record. San Diego’s start doesn’t seem as sustainable as Tampa Bay’s — the Padres have been outscored by three runs on the season. But star rookie Fernando Tatis Jr. has five home runs already, and with Manny Machado in the fold as well, the future suddenly looks a lot brighter in San Diego. Seattle hasn’t made the postseason since 2001, but the Mariners have slugged their way to the top of the AL West. They lead the majors with 39 home runs.